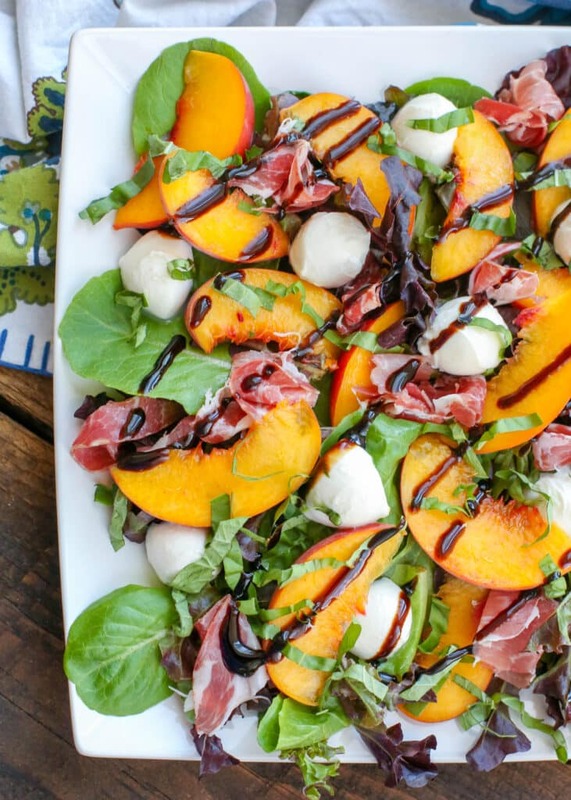 Sweet yellow peaches are tossed with fresh greens and basil then topped with mozzarella and prosciutto before being drizzled with a balsamic glaze to make this Peach Salad. 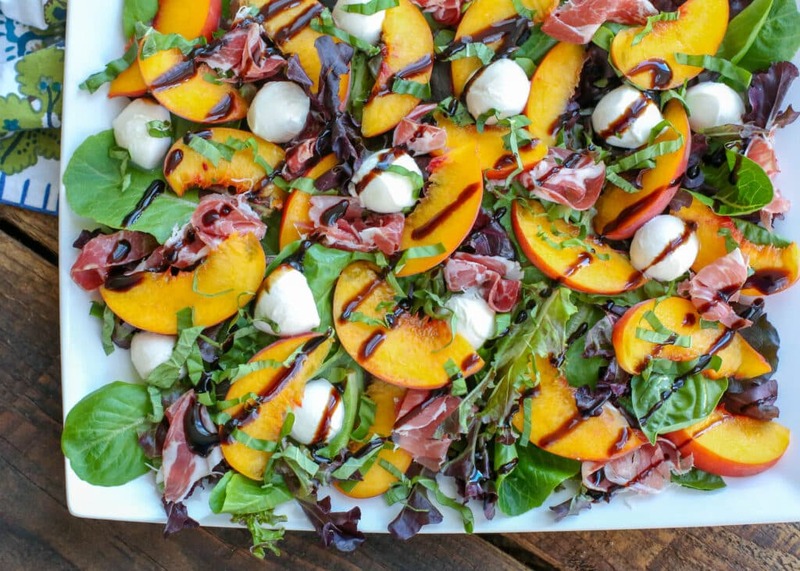 Inspired by the number of fresh peaches that have been in my kitchen as often as possible this summer, I’ve made this fruit sweetened version of the classic Caprese salad for lunch several times this month. 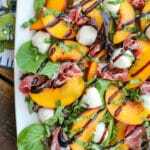 Surprisingly filling with cheese, prosciutto, and plenty of peaches, this Peach Salad is a savory-sweet combination that even my children enjoyed. I’ve mentioned before that salad recipes tend to be hit or miss with some of my guys. Southwest Chicken Salad with plenty of tortilla chips and a spicy ranch dressing? They’ll eat that every day. And this bacon and egg taco salad? That’s a sure win too. This Bacon Bleu Cheese and Shrimp Chopped Salad gets rave reviews. Apparently, the heartier the salad, the happier my family is. Lighter salads? And meatless salads? Those wind up being side dishes for our meals more often than not. My original plan was a very basic twist on traditional Caprese salad, with a layered plate of peaches, mozzarella, and basil. However, once I started adding more to the plate, it was a lot more fun and I realized we could make a meal of this salad. Peach season never lasts long enough for me, so I’m making the most of it. You’ll want to make sure you try the Southern Peach Cobbler before the peaches are gone this year. If you still haven’t tried Grilled Peaches, you’re missing out for sure. With a scoop of homemade ice cream on top, that’s a summer dessert dream come true. I can never have enough fruit salsas and this Peach Salsa by She Wears Many Hats looks heavenly. You can use that peach salsa to make this Peach and Brie Bruschetta by Recipe Girl. Start with your favorite greens: tender lettuces, baby spinach, arugula, or even a basic spring mix all work well with this salad. Slice fresh peaches thin, about 16 wedges per medium-size peach. 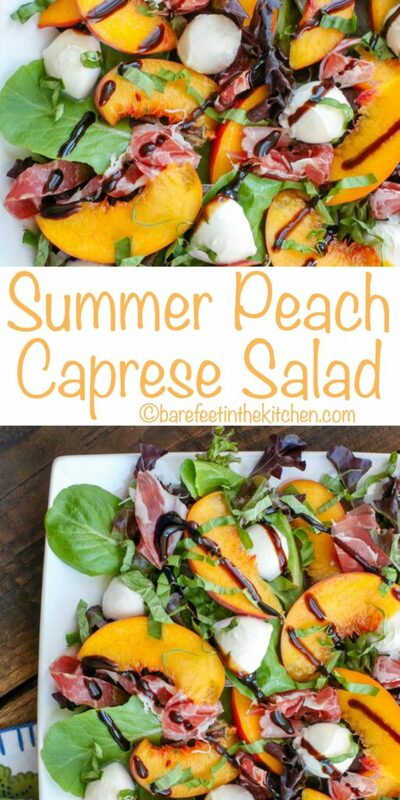 Toss the peaches with a little lemon juice, olive oil, salt, and pepper before layering them over the greens. Add plenty of fresh mozzarella to the salad. (Fresh mozzarella is typically sold in water and you’ll find it in little plastic tubs either in the dairy section or the deli at your grocery store. Fresh mozzarella is much softer than the brick version of mozzarella cheese. Drizzle the salad with balsamic glaze just before serving. Don’t feel like running to the store for the glaze in this recipe? No worries. It’s easy to make your own Balsamic Glaze. Pour 1 cup balsamic vinegar into a small saucepan over medium heat. Bring to a simmer and reduced the heat to low. Continue simmering until you have about 1/4 cup of balsamic glaze in the pot. That’s all there is to it. Now you can have balsamic glaze at your fingertips any time you want it. Here’s one final tip for you. You’ll want to avoid leaning over the pot to inhale the reducing vinegar. It’s potent as it cooks! Place the sliced peaches in a mixing bowl and drizzle with olive oil and lemon juice. Sprinkle with salt and pepper. Toss to coat. 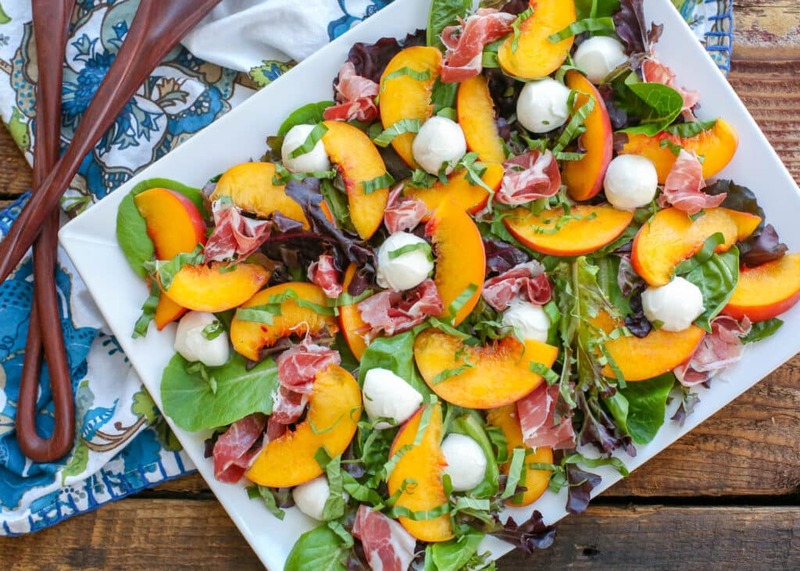 On a large platter or in the same mixing bowl, layer the spring mix, peaches, mozzarella, prosciutto, and basil. Drizzle with balsamic glaze. Enjoy! I've made this salad twice now and we LOVE it! I need to buy more peaches now. Thanks!